Mumbai: India, the world’s biggest buyer of vegetable oil after China, may increase palm oil imports after the government imposed a tax on purchases of crude soya bean oil, the main substitute product, a trade body said. The government levied a 20% duty on purchases late on Tuesday to shield oilseed growers from duty-free imports. “This is good news for oil-palm growers in Indonesia and Malaysia as they are grappling with huge stockpiles," said B.V. Mehta, executive director of the Solvent Extractors’ Association of India, in a telephone interview from Mumbai. 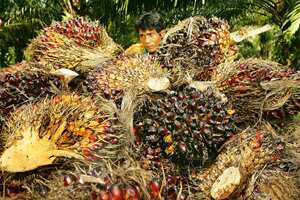 January-delivery palm oil gained 3% to 1,480 ringgit ($410, Rs20,377) a tonne, the most in two weeks, on the Malaysia Derivatives Exchange. Futures fell the most since at least 1995 last month on concern that the slowdown may stifle demand, adding to oversupply that’s pushed stockpiles of the commodity to a record in Malaysia. Soya bean oil for January delivery rose as much as 0.8% to 32.93 cents a pound in after-hours trading on the Chicago Board of Trade. Crude soya bean oil imported into the country will be costlier by $480 a tonne because of the tax, Mehta said. Refined soya bean oil imports will continue to be taxed at 7.5%. India’s soya bean oil imports fell 43% to 759,000 tonnes in the year ended 31 October, according to the extractors’ association. The country consumes 6.3 million tonnes of vegetable oils annually. The government may tax palm oil imports later this year to shield oil seed growers before elections due by May, said Dinesh Shahra, managing director at Ruchi Soya Industries Ltd, India’s biggest importer of edible oil. “The duty on soya bean oil is a half measure. The government will do everything to protect farmers before elections," he said. Prime Minister Manmohan Singh’s government has switched its focus from inflation to liquidity and growth as it seeks to shore up the economy. The government is considering industry-specific steps to help firms counter the impact of a global slowdown, finance minister P. Chidambaram said on Tuesday. The government must remove curbs on exports of cooking fats including peanut oil to ensure farmers get remunerative prices, the extractors association said in an emailed statement on Wednesday. India banned exports in March to curb domestic prices. Soya beans for December delivery on the National Commodity and Derivatives Exchange Ltd in Mumbai gained as much as 2.2% to Rs1,587 per 100kg, the most in three weeks.